"If you love garlic butter and cheese, this sandwich will hit the spot." Melt butter with garlic in a microwave-safe glass or ceramic bowl in 30-second intervals, stirring after each melting, for 1 to 3 minutes (depending on your microwave). Place hoagie roll halves on a baking sheet and brush each with garlic-butter mixture. 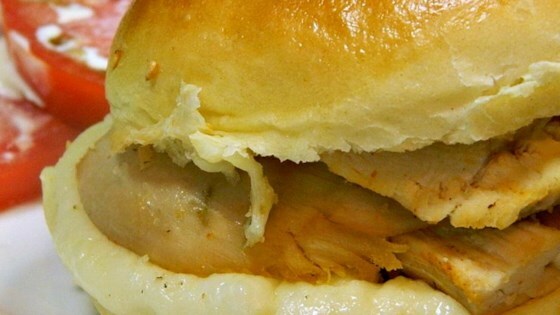 Divide chicken between each hoagie roll bottom; sprinkle cheese on each hoagie roll top. Cook in the preheated oven until cheese is melted and bubbling, 10 to 20 minutes. Press top and bottom sandwich portions together. Chicken breasts may be shredded or cubed, according to your preferences. The family loved it. I will make this again. it was easy and fun to make. I had my kids help me:) we will be making this again!!! Kids and husband liked these. Easy to make. I used filleted pan fried breasts and French rolls. Nice Sammie.